Meet Hector. He may look like a traditional Leather Club Chair but he's young at heart. He's got a proper sprung seat base, handsome, low curved arms and a nice, sprung back. His seat's the real treat though, when you hop on, it goes back forever! 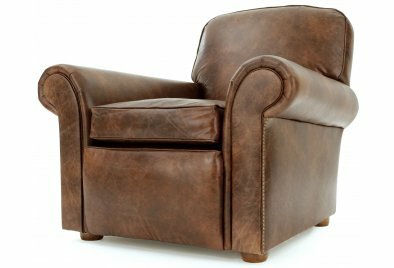 I bet you can't find a retro English Leather Armchair with a deeper seat. His thick, leather piped cushion has a shapely foam core topped with a soft, duck feather insert to keep up that 'lived in' appearance. He only wears Old Boot's gorgeous vintage leather, it's 100% real leather that looks a hundred years old but is super soft and smooth to the touch. Before you go, you should meet Hectors friends who all wear the same vintage leather as he does, that's if you haven't fallen head over heels for him already!